While it is not yet too late, the National Museum (NM) has initiated the putting up of historical markers in Spanish-era colonial arched stone bridges that have survived the test of time and the real risk of road construction and widening operations. Since then, these stone arched bridges would be treated as cultural properties of the country in pursuance of the constitutional right of the state to foster the preservation, enrichment and dynamic evolution of a Filipino culture, to conserve, develop, promote and popularize the nation’s historical and cultural heritage and resources. As cultural property, the NM means products of human creativity by which a people and a nation reveal their identity. Along this line, the old bridges are now under the protection of the State, which regulates its disposition. The historical marker, of the seven Spanish colonial stone bridges in Dimiao and three more in Lila now sits beside a creek in one of the seven bridges in Poblacion Dimiao, located along a street that runs parallel to the national highway. No less than National Museum Assistant Director and Cultural Properties Division Angel Bautista represented the NM while Catholic Bishops Conference of the Philippines Cultural heritage of the Church Chair Rev Fr. Milan Ted Torralba led the unveiling of the marker that lumps the 10 bridges which the government has just placed its mantle of protection. Built possibly between the late 17th to the 18th century, these stone arch bridges provide an easy access for land travel across creeks that flow across the town. 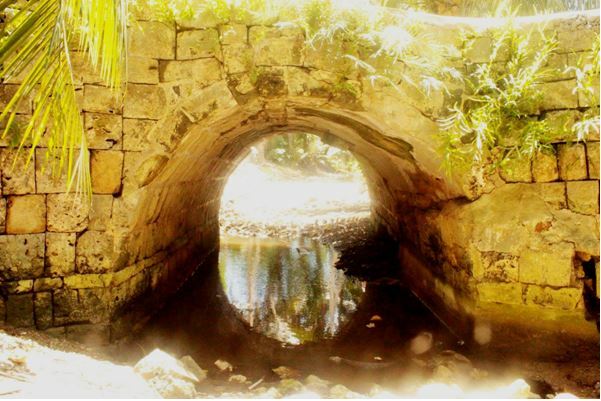 Made of roughly hewn coral stones, these Spanish colonial bridges work on the basic principle of the curved design. The curve does not push load forces straight down, instead these forces are passed along the curve of the arch to the supports on each end, called abutments. The abutments carry the load of entire bridge and are responsible for holding the arch in its precise stable position, as passing on the forces across the arch is through a central keystone on the top of the arch. This central keystone pushes the surrounding rocks down and outward, making entire structure very rigid and strong, explains modern day builders who have studied the arch bridges popularized during the Roman Empire and possibly copied by the Spaniards to make land travel more pleasant. “We were able to document seven of these bridges in Dimiao alone,” shared NM Bohol officer in charge and Dimiao resident Engr. Joel Dahiroc. He added, they also found at least three more preserved bridges of similar construction in nearby Lila town, most of these historic architectural marvels at the risk of getting destroyed for road expansion and widening operations. A similarly built arch bridge is also along the national highway between Tagbilaran City and Baclayon, and when the road widening project hit the bridge, the contractor made plans that would retain the old Spanish bridge. The Lao Bridge in Taguihon Baclayon may look modern on top, an old stone bridge sits below it. Reports of another stone bridge in Loon which is now preserved even with the recent road construction over it, already reached the National Museum. Through the unveiling of the historical markers, these heritage structures, which have been declared only recently, opens up the tempting potential for communities who have similar Spanish structures and infrastructure to notify the NM so that validation could be done quickly, Dahiroc said.